The property was first developed by John J. Clarke in 1878 when he homesteaded 350 acres. He raised cattle, logged and built a small homestead cabin that still exists as the oldest part of the house. The center of the house and the stone walled root cellar were built by “Cousin Jack,” the best carpenter in Central City, in 1883. As most Evergreen residents, Clark used the land to log wood to meet the growing demand for lumber in Denver. 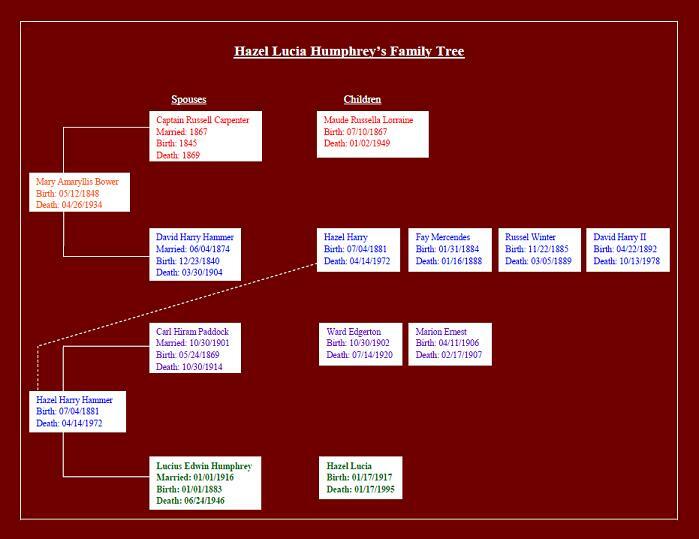 In 1920 Lucius (Lee) and Hazel Humphrey bought the ranch and moved here in 1921 with their daughter, Hazel Lou. The Humphrey’s named the property Kinnikinnik Ranch. 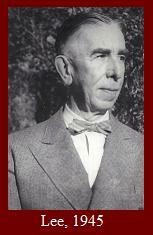 Lee Humphrey was born at his grandfather’s farm house in Jericho Center, Vermont in 1883. His ancestors came to New England from England in 1680. His newspaper career began early as he was editor-in-chief of his school newspaper at Edmonds High Schools. 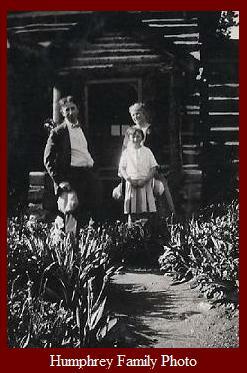 He moved to Colorado in 1911 with his first wife Blanche. 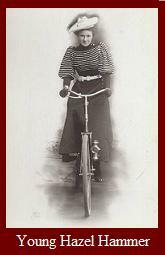 She died of tuberculosis in 1914. Lee was head of the copy desk at the Rocky Mountain News for 25 years and the Denver Post for 10 years. He was a newspaperman’ s newspaperman and according to the Rocky Mountain News, “never too hurried to be right and never too busy to be courteous and kind.” He even helped Mary Chase, author of Harvey, when she was a young reporter. He too was known as the mountain area’s first year round Denver commuter. An honor indeed as Evergreen did not become know as a commuter community until the 1950s. He drove a Model T, that he named Mary Ann, for two and a half hours daily to reach the copy desk in Denver. At the time of his death in 1946, the Rocky Mountain News estimated that he had driven over a half a million miles - just to get back to the home and family he loved. Hazel Humphrey was the daughter of David Harry Hammer, a wealthy circuit judge from Chicago. Her mother, Mary Hammer, was a well-known socialite and traveled all over the world collecting art, textiles, furniture, and other curiosities. 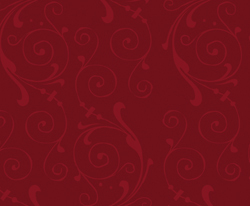 Childhood for Hazel was a dizzying delight of formal parties often featuring orchestras and costumed entertainers. Hazel was educated at English boarding schools and traveled extensively with her mother touring Windsor, Oxford, Cambridge and Lincoln Castles, attending receptions by Lady Rothschild, ridding lessons at Regents Park, and even was presented to the Queen. However, Hazel’s happiest days were spent at the Hammer family farm picking potato bugs (earning a penny for each hundred! ), mowing lawns, riding horses, feeding chicks and gathering eggs. The healthful farm environment may have influenced her decision at age 14 to become a vegetarian, unusual for that time and certainly at that young age. On a trip with Mother Mary to a Women’s Club Convention in Colorado, Hazel met a young Denver newspaperman at a dance. As their friendship deepened, Mother became alarmed and whisked Hazel away to Europe. Hazel, however, was not to be distracted by the social whirl. Correspondence between Hazel and her beau continued and, much to her mother’s chagrin, Hazel became Mrs. Carl Paddock on October 30, 1901. Her only attendant was her younger brother as ring bearer. For 13 years, through struggle and loss, Hazel and Pad crisscrossed the country from California to Virginia in pursuit of “dreams and schemes which never materialized”. Ward Edgerton Paddock was born in 1903, who died at age 18 in a runaway wagon and Marion Ernest Paddock, who died when 10 months old, in 1907. When Pad died in 1914, Mother refused to help Hazel and young Ward. For two more years, Hazel’s fortitude and resilience pieced together a living for her and her son. Then, in 1916, she met and married Lee Humphrey. Hazel and Lee found happiness together in a brick bungalow in Denver, where Hazel Lucia (Hazel Lou as she was more commonly known) Humphrey was born in January 1917. 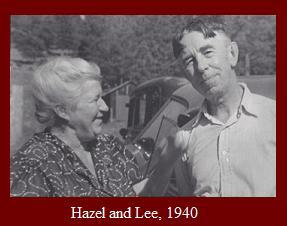 Lee died in 1946 of cancer and Hazel died in her bed in 1972 at the age of 90. Hazel’s life is the story of a pioneering and resourceful Colorado ranch woman and how her life evolved is a fascinating look at the conventions of the early 1900s contrasted with the westward thrust of young America. When the Humphrey’s first moved to the Kinnikinnik Ranch, young Hazel Lou was less than enthused about the living accommodations, so dissimilar from her fine home in Denver. “…a shack”, she wrote. “The roof leaked, the windows were shattered, big holes in the floor allowed squirrels to poke their heads up, and the place was full of bedbugs.” Most frightening was the open ladder leading to her room on the second floor. However, the property underwent numerous transformations and renovations in the following years. Two storage rooms and a bath were added, all of the same hand-hewn logs as the main building from an old barn on the property (reconstructed and now used as the garage, office and gift shop). A screened porch later became a laundry room and back entry. The old homesteaders’ cabin was dismantled and carefully rebuilt as a bedroom addition beyond the living room. 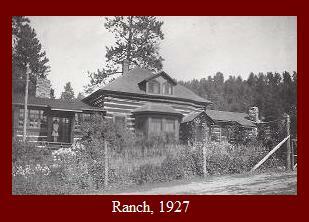 The ranch became the Humphrey’s permanent residence in 1921. Hazel Lou call the ranch home until her death on her 78th birthday, January 17, 1995. Hazel Lou had a zest for life and a life long interest in civic affairs. She considered herself a red, white and blue pro-choice environmentalist Republican. She was active in the League of Women Voters and belonged to the Daughters of the American Revolution, the Society of Colonial Dames and was instrumental in organizing JCHS. In fact, in 1984 Hazel Lou was inducted into the prestigious Jefferson County Hall of Fame for her work in preservation. She was a vegetarian, an accomplished horsewoman and tended to a menagerie of animals at the Kinnikinnik Ranch including a nationally recognized herd of Toggenberg goats. Hazel Lou trained her horse Cheyenne to do 17 tricks. Cheyenne was with Hazel Lou for 27 years. 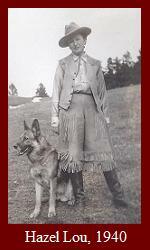 Prior to Cheyenne, there had been family horses named Angel, Lady and Jean. After Buffalo Bill’s death in 1917, Lee purchased Buffalo Bill’s horse Whitey. The horse was spooked at the ranch and was kept in Denver. Hazel Lou was proud of her family heritage and it was her wish to dedicate the property as a park and museum in memory of her family. She left the property and family home to the Museum in her will. She had received National Register designation for the property in 1974 and had set up the non profit corporation, by laws and all. She was an amazing lady that many residents of Evergreen still remember.